Fredrik Ferrier releases debut single! 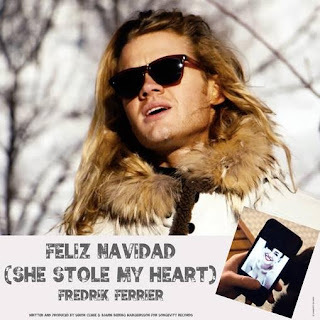 Singer-songwriter Fredrik Ferrier, has released his first single just in time for Christmas – the soulful Feliz Navidad (She Stole My Heart). Fredrik, who has had success as a TV star, was discovered by Ivor Novello and Grammy Award-winning singer-songwriter and producer Simon Climie, who co-wrote the song especially for Fredrik and has been recording with him this autumn. Feliz Navidad (She Stole My Heart) is a perfect marriage of voice and song, and Fredrik recently flew to the Italian Dolomites to record a romantic, snow-filled video to accompany the release. His honey-smooth vocals accompany his emotional stroll through the snow-covered mountains as he looks up to the sky, longingly wishing for the girl who stole his heart. Simon has worked with a host of global music stars, including Eric Clapton, BB King, George Michael and Aretha Franklin (he wrote the latter’s chart-topping duet, I Knew You Were Waiting). He was also famed as a pop star himself as one half of duo Climie Fisher, who had a number of hits. Feliz Navidad (She Stole My Heart) was co-written and co-produced with iconic Icelandic composer and producer Bjarni Biering for new record label, Songevity, and also features the amazing trumpet playing of Simon Gardner. The single is available on iTunes, Spotify and Amazon now!